Bates College presents the Larchmere String Quartet, the quartet in residence at the University of Evansville in Indiana, with music by Haydn, Barber and Dvorak at 7 p.m. Sunday, March 31, in the Olin Arts Center Concert Hall, 75 Russell St. Admission is $12, available at batestickets.com. Free tickets are available for the first 100 students and seniors by reservation: olinarts@bates.edu. For more information, please call 207-786-6135. The Larchmere String Quartet is composed of violinists Timothy Kantor and Sun Hye Oh, violist Rose Wollman and cellist Schuyler Slack. Named after the Cleveland street where they spent much of their early rehearsal time together, the LSQ was founded in 2011 at Indiana University’s Jacobs School of Music. 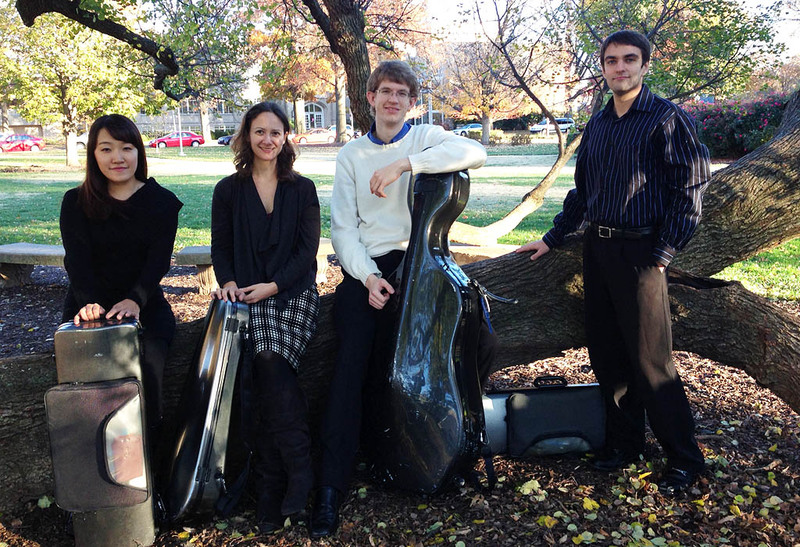 They are the Eykamp Quartet in Residence at Evansville. Kantor was recently appointed concertmaster of the Evansville Philharmonic. He is a champion of new music and has participated as soloist, concertmaster and chamber player with new-music ensembles at the Cleveland Institute of Music, the Percussion Plus Project at DePauw University and Margaret Brower’s Blue Streak Ensemble. He graduated with honors from Bowdoin College and has a master’s degree from the Cleveland Institute. Oh was born in Seoul, Korea, and earned a bachelor’s degree in violin performance from Wichita State University and a master’s from the University of North Texas. Before coming to Indiana, she was a member of the Wichita Symphony, the Richardson Symphony and the Las Colinas Symphony, as well as the prestigious Bancroft String quartet at North Texas. Wollman is an active performer, teacher, chamber and orchestral musician. She is the violist for the Petar Jankovic Ensemble, composed of string quartet and guitar, with whom she has toured the United States and Europe. Wollman has been involved in the premiers of much new music in the Boston area and at Indiana. Wollman is currently pursuing her doctorate in viola performance, with a minor in music theory, from the Jacobs School. A native of Alexandria, Va., Slack decided he wanted to play the cello at age 3 when he watched Yo-Yo Ma play on TV. His musical endeavors have led to performances across the United States, Canada, Europe and Japan. Having completed undergraduate studies at the Cleveland Institute in 2010, Schuyler is finishing his pursuit of a professional studies certificate from the same institution.